BMC finally converted their efforts into a stage win as Philippe Gilbert caught Tanel Kangert at the death, before then motoring up to the line and finishing several bike lengths ahead of maglia rosa Alberto Contador. Stage 13 is the most clear cut chance for the sprinters to make their presence here worthwhile, especially having learnt a harsh lesson on Stage 10 when beginning the chase to the breakaway far too late. Without the slightest kink of tarmac during the day, the likes of Lotto-Soudal, Trek Factory Racing and Lampre-Merida will do their upmost to control the race as best as possible and guarantee them a sprint finish on this occasion. 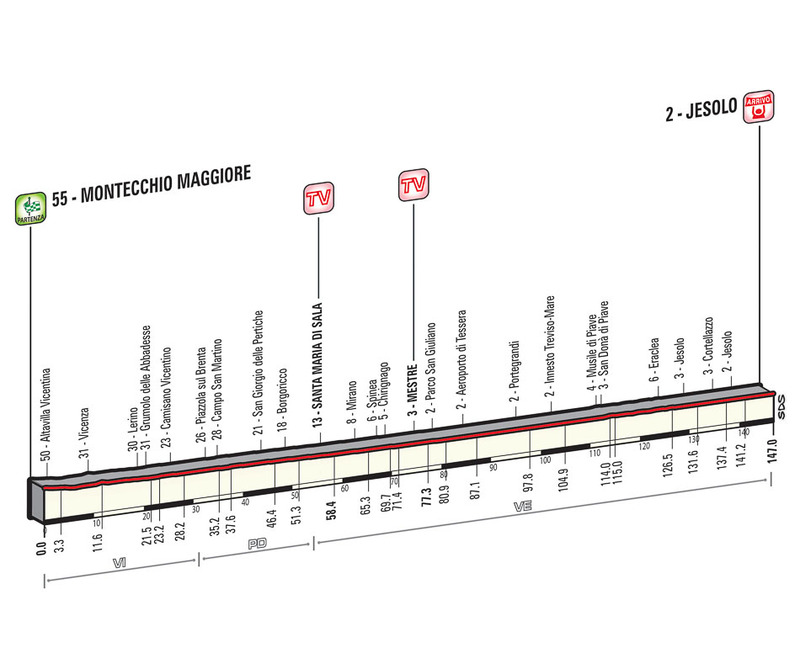 The course for Stage 13 offers little to discuss, starting in Montecchio Maggiore it rolls steadily towards the coast yet again during this year’s Giro d’Italia, finishing some 147km later in Jesolo. A short and simple affair which will allow the major general classification rivals to turn their legs over with little stress, with the big mountains appearing in the coming days for them. Some anxieties will remain present as ever however, the sprinters and their squads will have to stay alert to the varied threats of road furniture which can scupper a rider’s chances in an instant. Positioning will be key in the finale as the leaders trace their way around two roundabouts in the last kilometre, before then making their final turn and exiting on to the 500m long finishing straight which shall crown the winner in Jesolo. Attention will once again turn to the riders who are synonymous with these fierce gallops to the line, but the fastest on paper might not win here after several days which proved more testing than expected. Freshness will play a key part, those who have limited their exertions since Stage 10 will view the day has an opportunity to restore the natural order of things at the Giro. André Greipel has already proven during this tour that he is the fastest in a flat out drag race to the line, but Stage 13 is not quite the type of finale which he will have fancied in order to double his tally so far. The technical finish does not suit his attributes at all, even though his lead out at this Giro has been far better than expected given the limited personnel available to him. Perhaps most importantly of all for the German’s chances of winning in Jesolo is the likelihood of a strong downpour as they approach the finale, a slippery surface could deter Greipel from committing wholeheartedly at the risk of injury and an awareness that at least two further sprint stages remain. If conditions are favourable however and the Lotto-Soudal lead out nullifies the technical finish somewhat, André Greipel remains the man to beat in a straight up sprint. Lampre-Merida know that Sacha Modolo has a penchant for tricky finishes and will do their upmost to place him in contention for the win on Stage 13. It is widely agreed that the Italian wields the most potent lead out in this race and has already clearly benefited from a team which almost guarantees him a good position when having to follow the likes of Greipel at full gas. Factoring in the likelihood of the weather and the final two kilometres of racing being technical, Modolo could dominate from a slightly slower sprint and win thanks to a solid lead out from his Lampre-Merida teammates. An eternal nearly man at this race, Trek Factory Racing’s Giacomo Nizzolo could finally throw the form book out the window and secure his debut Giro d’Italia win at last. He appears to be one of the freshest sprinters in this race, despite his repeated efforts during the intermediate sprints, a fact which could see him brought right to the fore once again. Like Modolo, Nizzolo also performs better on these tricky finishes, but would have preferred an even more technical conclusion to this stage like his compatriot. Trek Factory Racing offer reasonable support to Nizzolo and are reliable when it comes to dropping him off in a good position with 750m remaing; though he has no issues with following wheels if need be. Ultimately, Giacomo Nizzolo is a real contender for this stage, a day which could be historic for the Italian finally breaking his duck at the Giro d’Italia. Quite possibly the next fastest man after André Greipel is Team Sky’s Elia Viviani, but he has not demonstrated this well beyond his win on the opening sprinters’ stage. Though fast, he desperately lacks anything in the shape of a lead out, while also not really suiting this finale in the slightest. It is both technical and likely to be wet, with this in mind, Viviani’s chances of doubling up in Josolo are markedly reduced. Given his innate turn of speed, he will remain a danger, though a lot will need to go right for him, or wrong for the others in order to win. Nicola Ruffoni has been working away very hard for his team in the sprints and is sure to be part of the top riders to decide the podium at the end of the day. The Italian youngster is incredibly fast, but does not have much in the way of teammates to protect his interests when it matters most. Bardiani-CSF rely on his ability to pick the best wheel ahead of him on his quest for a stage win and he certainly stands a chance on a finish which reshuffles the order of contenders considerably. Though possessing a reasonable lead out at this race, Luka Mezgec simply has not performed to a standard now expected from the Slovenian sprinter. The Giant-Alpecin riders assigned to him in the sprints are not as well oiled under his leadership compared to that of John Degenkolb or Marcel Kittel, but they should still be helping their man chart higher in the sprints. Much like Viviani, Mezgec has plenty of pace to have a serious tilt at taking the win, but with little support and little having gone right so far, his chances remain less likely than those above. With the lesson learnt from Stage 10, an agreement will surely be made between several teams during Stage 13 to ensure that any breakaway is given a very tight leash indeed. Lotto-Soudal, Trek Factory Racing, Lampre-Merida, Giant-Alpecin and even Bardiani-CSF will want to reel in those up the road and bring it back for a hectic finale in Jesolo. A reasonably technical finish which could be worsened by poor weather conditions makes it likely that André Greipel and Elia Viviani will not be able to decide the win with a simple enough drag race all the way to the line. Instead, those who possess a knack for these tricky run ins to the finish will come to the fore and use a short and sharp acceleration to secure the win. In this situation it could be a tale of two Italians with Giacomo Nizzolo and Sacha Modolo both having a great chance to take their first ever Giro d’Italia stage wins here. Nizzolo has been in these positions before but still remains winless at his home tour and it looks to be Modolo who will prolong this nightmare once again. Lampre-Merida are stronger in the leadout and also appear fresher after several testing days as of late, assuming they ratchet up the speed in the final kilometre before letting Modolo attack the line, the winner in Jesolo could be clad in the neon tones of Lampre-Merida. Posted on May 22, 2015 by Spokenforks	This entry was posted in Giro d'Italia 2015, News and tagged Andre Greipel, Bardiani CSF, Elia Viviani, Giacomo Nizzolo, Giant-Alpecin, Giro, Giro d'Italia, Jesolo, Lotto-Soudal, Luka Mezgec, Nicola Ruffoni, Preview, Sacha Modolo. Lampre-Merida, Spokenforks, Stage 13, Team Sky, Trek Factory Racing. Bookmark the permalink.